He practised all his life during, the worship of Surya (sun). His vedic design of Surya and his way of adoring this supreme power such as it was it by the old wise ones, attached him to this tradition. The beauty of Surya Sadhana (practical of the sun-worship) lies in the fact that it is about a total union. Approached according to a design rigorous, and carried out in an adapted spirit, it leads to the realization of a physical body to the pleasant aspect with a pure and strong mind. The face is irradiated by it. It gets a well ordered life from where peace and happiness emanate. This yogi was a Master of Prâna, solars Mudras, Kriyas with regard to his practice of hatha yoga. His practice of Surya Namaskar (sun salutation with many variations) was done in retention of breath throughout the whole salutation. The retention of breath as well as the repetition of mantras, the sun salutations, the worship of Surya yantra and even more Surya tratak get huge benefits to the sadhaka. Especially when they are accomplished with the assistance of a guide, they contribute to the development and the blooming of the personality. They allow obtaining supernatural capacities and a spiritual conscience leading to the realization of oneself. The repetition of Surya Stotras (as Aditya Hrdayam) provides a very effective help. Yogi SATCHIDANANDA was the perfect illustration of this state of being. Sri Sri Sri Satchidananda represented this class of elites of yogis who practise in the the traditional way and style of old Rishis. Rishis were withdrawn in the forests and in the mountains where they fasted and meditated for long periods before reaching the release (Moksha) and during several generations their methods were kept secret. Only some trusted disciples could share these secrecies. Sri Sri Sri Satchidananda belonged to these rare privileged person. This special Yogi used his knowledge to help people in their thousands to relieve their suffering through yoga. He made the wish of renouncement. Everybody were treated without any discrimination for their caste or social status, and they could enjoy in the same way a personal monitoring. 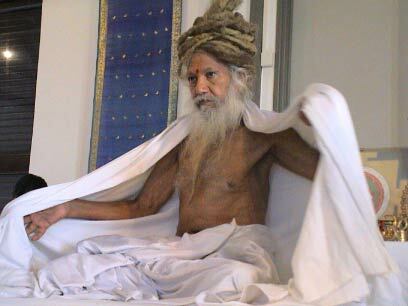 Sri Sri Sri Satchidananda yogi had created the Sri Vasavi Yogasram for forty year and whoever approached him to be examined received free treatment. He was presented as a prodigy person with various talents. Whoever had the privilege to see when he practiced can attest that he was as flexible as a piece of rubber and as nimble as a young man of 16 year old. He had an alert spirit with an humble and compassionate being. He had a lot of sense of humour, his face was radiant even if he never spoke. Sri Sri Sri Satchidananda made wish of silence (Mauna Vrata) for forty year, which intensified his spiritual conscience. He communicated by means of signs and written notes, but also by subtle way with his close disciples. This silence, to which was added a major knowledge, produced a powerful impact everywhere he taught. Sri Sri Sri Satchidananda was the to introduce the teaching of yoga into all the schools and Indian institutions in order to train young people for a practice of this science which would enable them to have a healthy body, an alert spirit and to improve their intellectual abilities. He affirmed that yoga could eliminate the impure thoughts and the wrong actions and would be favorable to the emergence of a healthy and happy society. He was the illustration of the success of Yoga. Many of his former patients came to visit him back. They did not hesitate to describe the miraculous way in which they were cured. He also accepted many western disciples, some of them were elected to propagate his teaching throughout the world. Sri Sri Sri Satchidananda left this terrestrial plan in September 2006 at an age almost centenary. He was our Master, the one who lights and guides. He is which one gives the impulse to rise the spirit. Each day we pay tribute to him, and every day he is close to us in our task to teach you. He liked so much La Réunion!